Being a typhoon seems to be the "in thing" lately for tropical cyclones in the Western Pacific, and Melor is now one of the "in crowd." NASA's QuikScat and Aqua satellites helped the U.S. Navy's Joint Typhoon Warning Center confirm that Melor now has sustained winds near 115 knots. The Marianas Islands have posted watches and warnings anticipating Melor's arrival. On October 1 at 15:00 Zulu Time (1 a.m. October 2, Pacific/Guam Time), Typhoon Melor was located approximately 420 nautical miles east of Guam, near 14.4 North and 151 East. That also puts Melor 355 miles east of Saipan, and 360 miles east of Tinan. Melor has tracked northwestward at 6 mph while continuing to intensify. Melor is generating high surf, with waves as high as 26 feet. A tropical storm warning is now in effect for Rota, Tinian and Saipan. That means tropical storm conditions are now happening there. The National Weather Service in Guam issued the following statement: "Melor will be a large and dangerous system before it reaches the Marianas. The radius of damaging winds already extends far from the center. The onset of damaging winds is possible in the northern Marianas early Saturday morning and Saturday afternoon on Guam." QuikScat saw Melor's winds swirling inside its clouds by using microwaves to peer into them. It flew over Melor and captured an image on September 30 at 7:39 UTC. 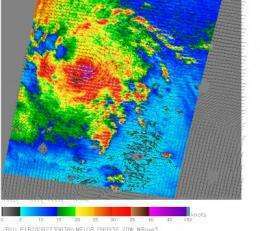 QuikScat can actually determine the speed of a tropical cyclone's rotating winds using microwave technology. QuikScat imagery is false-colored to show different wind speeds, the highest winds are always shown in purple, indicating winds over 40 knots (46 mph). Small barbs are used in the images to indicate wind direction and point to areas of heavy rain. 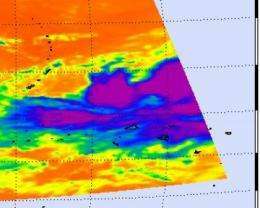 While QuikScat took a look at Melor's winds, the Atmospheric Infrared Sounder (AIRS) instrument on NASA's Aqua satellite identified the storm's icy cloud temperatures. Those temperatures help determine the height the clouds and thunderstorms. The colder the clouds, the higher they are, and the stronger the thunderstorms. The satellite images, which false-color clouds based on their temperature, showed a large extent of cloud cover. In AIRS images, purple indicates the highest thunderstorms (and strongest), and blue areas are the second coldest and highest clouds. Melor is approaching the island of Saipan, and is forecast to swing north of there on its journey northwest.